But it's nice to have things to look forward to, so here goes with another one. Just as I wanted a 'pick up and put in a car by two people' battery electric I thought it would be good to be able to do the same one day with a live steamer. A coal fired one to boot. I don't think there will be a problem size wise but it's early days in the 'guess the weight of the loco' game. So, from left to right the thoughts of the Pell Wall Agricultural Tramway's chief engineer (I'm pretty sure I'm not worthy of capitals for that title). Ah, should have mentioned, the base item is one of my flat waggons. The base height is probably much greater than anything that is ever built would be but the photo made for a useful kicking off point. I have shown twin oscillators as I believe that they may be cheaper to manufacture than more traditional types. Power to be transmitted, and geared down, via chains and cogs. 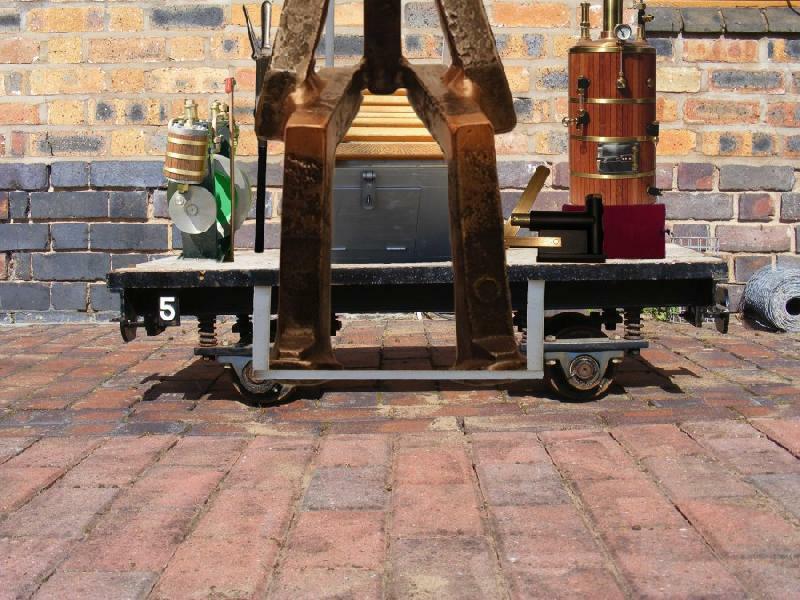 Thus we avoid the extra complexity of quartering drivers, having coupling rods etc. Actually more than a seat as the space underneath would be for the water tank. Like the battery electric sideways facing . Those who know about these things say it is best to have two methods of getting water into a boiler (minimises the risk of things going BANG! and upsetting folk I believe). So a hand pump seems an obvious back up to either a steam injector or electric pump. That boiler is about 10" high and 5" diameter, excluding the chimney and should be adequate. Again, with my cheapskate hat on vertical boilers are simpler and thus cheaper to manufacture than horizontal. It is shown sitting on a reddish box as this is envisaged to a. give a little extra height and b. one could fit in an ashpan to avoid hot coals falling on to plastic PnP sleepers. Not necessarily a good mix. Note also the fire door faces sideways, not towards the driver. I think I am right in saying that Heywood locos are generally not fired 'on the move' and designing my loco like this avoids back breaking contortions. Run up and down the line. Pause to load/unload waggons. Feed the fire. Proceed. What's not to like? Wheelbase: somewhere between about 16" and 20"
Any input, especially from those who actually do have engineering expertise, would be very welcome. Whilst proper steam power is oft regarded as the holy grail of locomotive traction it has a bunch of downsides. For example I know of a couple of folk who found that the overall bother of annual boilers checks and other stuff for minimal use of a loco made ownership of a live steamer a chore rather than a pleasure. So, reaching for my cut down version of Photoshop again I've whizzed through a quick faux steam design. As you can see the overall look is pretty similar to my steam version. The Stockers weight is still applied dead centre for use as ballast . The boiler itself would now be a piece of eight to tennish diameter pipe, painted black and then 'lagged' with wooden strips. 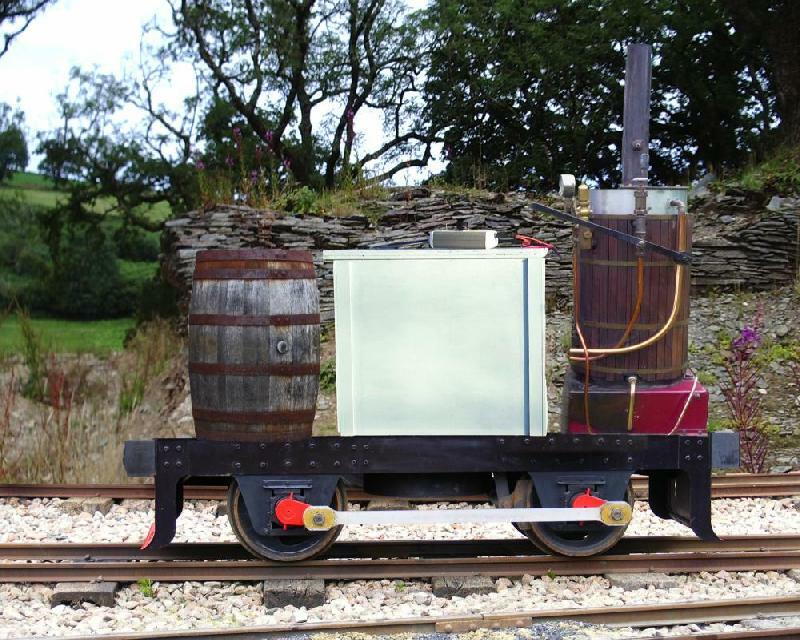 An old wooden barrel would give that 'rustic' water tank feel whilst the grey box wood houses the electric motor as in my current industrial BE loco. Now, one can buy (indeed, I did) sealed non-spill batteries, not over large, which means that they could actually lie on their side within the red box that the boiler sits on. And there one has it - a Stockers faux VB. About 38"-40" long and instantly available for work. But Stocker's, I fear you may have missed the point that although a live steam loco is more work than a BE, with it's regular inspections, constant replacement of bearings in the intricate motion, the failing of an injector when someone "important" is looking over you, the occasional crap coal causing steaming problems whilst going over the bank with ten on, the slipping caused by an over enthusiastic mech lube and a leaking gland packing.... It's all part of the fun. And whilst it may be great to switch it on and go, it's like making a cup of tea.